The Sidewinder, at 1 8 to 30 inches in length, is a small rattlesnake of the western United States desert that has developed a method of locomotion which involves rolling rather than undulating its body along the ground. 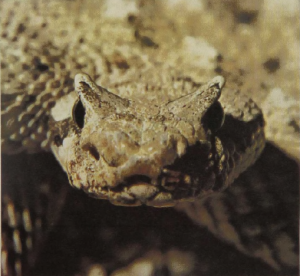 The motion, which proceeds quickly and is difficult to understand or describe, makes use of static friction to keep the snake from slipping when it is crossing the soft sand of dunes. Sidewinders can thus travel over sand dunes faster than other snakes and move well for over a mile at a stretch. Sidewinders are nocturnal; during the day, when the surface temperatures are much too high for any snake, they burrow in the sand under bushes. This snake uses its effective propulsion to search the desert for the small rodents and lizards which make up its food.